NEW ZEALAND SCHOOL PLEDGE - "The Great War proved that thousands of our brave New Zealand soldiers thought this beautiful land of ours was worth dying for. We are too young to do as they did, but we pledge ourselves, so to live, that when our hour of trial shall come we shall not be found wanting. We salute those who gave their lives that we might live in peace and security." * - Please note this system of numbering was only used until the formation of the 10th Reinforcements as it was found the system too confusing when personnel were moving between units. My favourite World War One photo. My husbands grandfather John Walker Alexander #20278 is the tall one in the centre of the back row. This will be at either 1st NZ General Hospital, Brockenhurst or NZ Convalescent Hospital, Hornchurch in September or October 1917. Sir James Allen [Minister of Defence] gave the number of men in the New Zealand army. The original body sent to Samoa was 1955, and the men sent to the front numbered 74,000, but that did not include the British section, numbering 240. The New Zealanders who had joined the Royal Flying Corps numbered 18, the Royal Naval Auxiliary Patrol 190, Imperial Reservists 211, naval ranks and ratings 190, H.M.S. Philomel 159, guards for German prisoners 2, and nurses 435. In addition there were 9024 men in training, making a grand total of 86,402. It would in all probability take another three or four months before we would have sent away those reinforcements, and the number supplied rose to 86,000. We originally sent away a Maori draft of 500 men, and since then we had sent 1757. Rarotonga had sent away 161 men. Over 400 men had been sent away for tunnelling purposes and 63 wireless men had done splendid work in Mesopotamia. Already 10,547 men had returned [sick and wounded]. Of those 8573 had been discharged, and no less than 1238 had been restored to health and strength and had gone back to the front to fight again. Up to July 23 some 26,000 men had suffered casualties, and of that total 7500 would never see New Zealand again. One hundred men were missing, 71 were prisoners of war, and 18,879 were wounded. Please note that the search engine will not search for names on sites that I have linked to. NZ - Military Files - World War One - Linked. An index to the trench magazine "New Zealand at the Front" - written and illustrated in France by men of the New Zealand Division - undated. New Zealand - Air Deaths - 1914 - 1920. New Zealand - Merchant Navy Deaths - 1917 [on board the Aparima]. New Zealand - Naval Deaths - 1914 - 1920. NZEF - Roll of Honour - 1914 - 1923. Auckland Education Board - Roll of Honour. Roll of Honour - New Zealanders killed whilst serving in other forces during World War One. Roll of Honour - New Zealanders killed at Gallipoli whilst serving in the Australian Imperial Force [AIF]. South Canterbury World War One Roll [SCRoll] - Linked. NZ - Auckland Mounted Rifles Timeline - 1914 - 1919 - Linked. NZ - Canterbury Mounted Rifles Timeline - 1914 - 1919 - Linked. 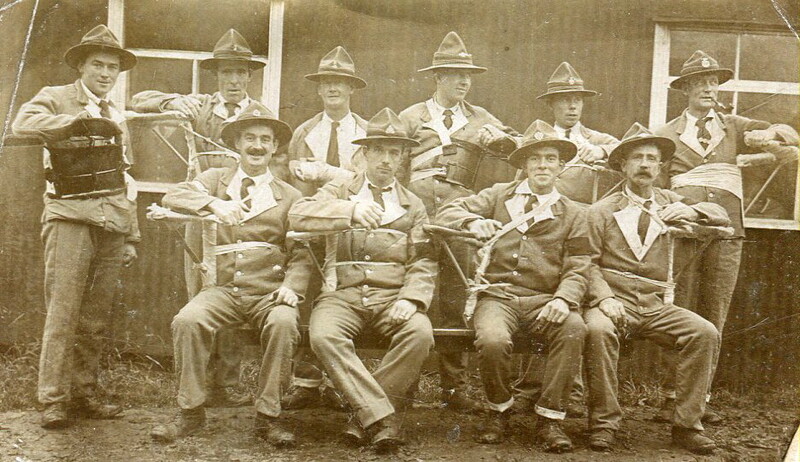 NZ - Wellington Mounted Rifles Timeline - 1914 - 1919 - Linked. New Zealand Military Nursing - Linked. The Mount Felix Tapestry - In the four years it was open during World War One, over 27,000 wounded New Zealand soldiers were cared for at Mount Felix and welcomed into the heart of Walton on Thames. - Linked. World War One Military and Auxiliary Hospitals in London and Surrounding Counties - Linked. Prisoners of the First World War - International Committee of the Red Cross - Linked. Royal Flying Corps - Linked. Australia Roll of Honour Database - Linked. Australia World War One Service Records - Linked. Australian Light Horse Studies Centre - Australian Military History of the Early 20th Century - Linked. Canadian Expeditionary Force Service Files of the First World War - Linked. Canadian Virtual War Memorial (CVWM) - Linked. USA - Online World War I Indexes; Records - A Genealogy Guide - Linked. The Great War was declared by the British Empire on Germany and her allies on 4th August 1914 [5th August in New Zealand]. The armistice was signed at 11am on the 11th November 1918 [12th November in New Zealand]. However the war did not formally end until the peace treaty with Germany was signed on the 28th June 1919, which is why many war memorials give the war years as being 1914-1919. There were approximately 750,000 British, Dominion and Colony casualties. The country with the highest proportions of deaths per head of population was New Zealand. Officers, especially Lieutenants and 2nd Lieutenants, were proportionally more likely to die than any other rank, largely because they were expected to lead raiding parties into No Man's Land. This is a Princess Mary Gift Tin. Princess Mary thought of the idea to give all Commonwealth Soldiers and Nurses serving in the Great War a Christmas present. A public fund was eventually set up. 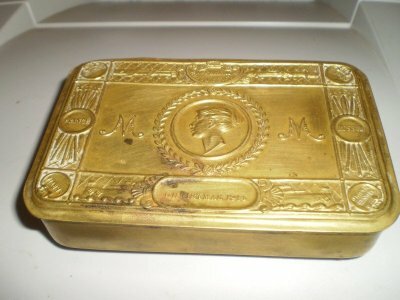 For more information see PRINCESS MARY GIFT TIN. Thanks to Adele Pentony Graham for this.